Sri Lankan wildlife defies conventional wisdom. Small islands are not supposed to have large animals. Someone forgot to tell this to the elephants, the largest terrestrial mammal. Not only is it found in Sri Lanka, the largest concentration of Asian Elephants, a seasonal gathering, takes place on this island. Every year, 'The Gathering' takes place on the receding shores of the Minneriya Lake, in the north central province of Sri Lanka. As the dry season fastens its grip on the dry lowlands, leaves wither and fall in the dry monsoon forests, waterholes evaporate into cakes of cracked and parched mud. The elephants must move on in search of food and water. The elephants, sometimes numbering over an awe inspiring three hundred, converge onto the receding shores of Minneriya Tank. Nowhere else in the world will one find such a high concentration of wild Asian Elephants concentrated into a few square kilometers. 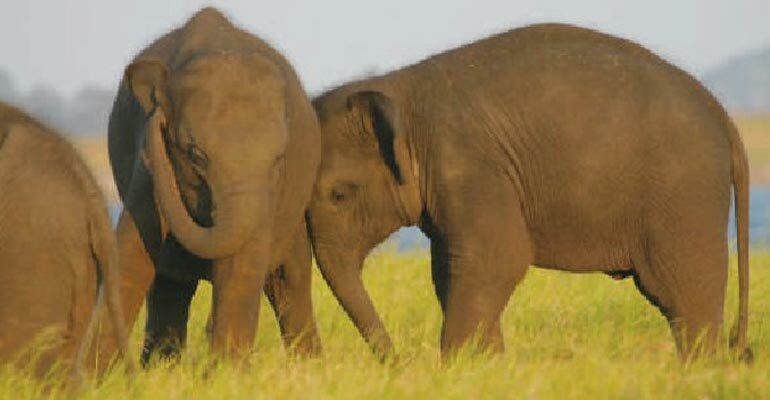 'The Gathering' at Minneriya is a wonderful opportunity for wildlife enthusiasts and casual travellers to observe the social dynamics of elephants. Matriarchs lead their clans to water, the whole group taking care to safeguard the baby elephants who are always flanked by adults. The basic unit of family society is a mother and calf. Clans of related elephants will coalesce into herds when they converge onto Minneriya in search of a common quest for food, water, cover and mates. The smaller herds group into even larger herds, sometimes numbering over a hundred elephants. Adult bulls mix freely, using their trunks to test the air for adult females who are receptive. 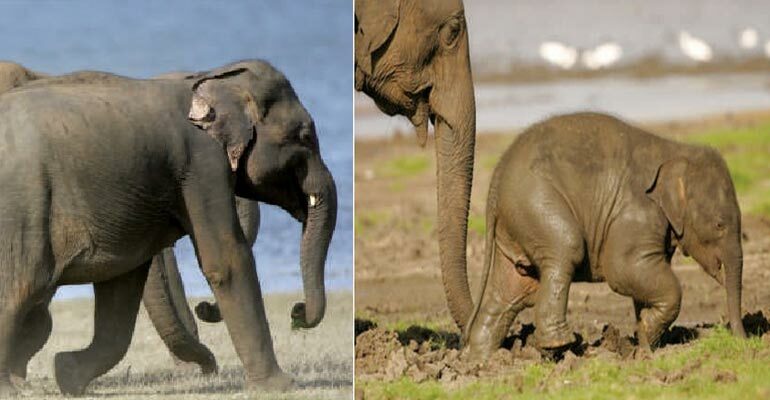 When a bull elephant attains maturity, it is expelled from the herd and wanders as a bachelor. At the gathering, elephants who have not seen each other for a year, renew acquaintances. Bulls tussle for dominance and calves play with each other. The Minneriya Tank or reservoir is an ancient man made lake constructed by King Mahasen in the 3rd century AD. Many centuries ago, these lowlands were farmed for agriculture by an ancient civilization whose mastery of hydraulics was remarkably sophisticated. Today, the ancient reservoir fills during the North-east monsoon and gradually shrinks as the dry season fasten the lowlands in a torpid grip. 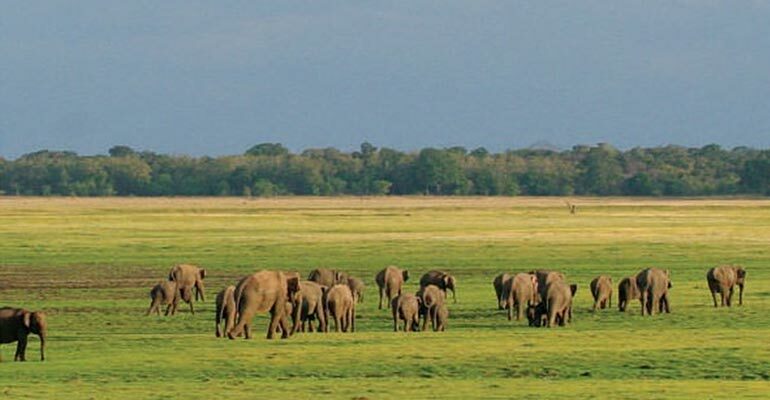 As the waters recede, lush grassland sprouts attracting elephants in search of food from far away as the jungles of Wasgomuwa and Trincomalee. The lake always retains some water and is surrounded by scrub jungle, which provides shade during the heat of the day. 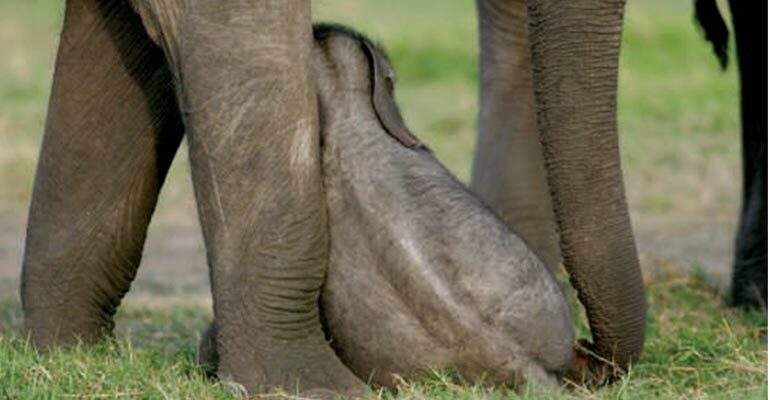 The Asian Elephant is a shade-loving animal. It is not endowed with as good an air conditioning system as its African cousin who has large ears. As evening falls, the elephants emerge from the scrub, in small herd of tens, coalescing into larger herds, sometimes numbering over a hundred. The 'Gathering' is one of the most unforgettable and fantastic events in the international wildlife calendar”. The Gathering begins from the middle of July and ends around the middle of October, with numbers at their peak in August and September. The locals will know whether the herds are gathered at Minneriya National Park or whether the nearby Kaudulla National Park offers better viewing at a particular time. Be guided by local advice and be flexible as to which of the parks you visit. Why is it called 'The Gathering'? Because that is what it is. It is a seasonal movement of elephants and not quite a migration in the sense of what biologists mean by a migration. Choose a reputable tour operator who can make your arrangements for accommodation, park entry fees, safari jeep hire, etc. Hotels in the neighborhood can also make arrangements for jeep safaris. Minneriya which is the focus of 'The Gathering' is at the center of one of the richest areas for culture and archaeology. The magnificent ancient cities of Anuradhapura and Polonnaruwa, the rock fortress palace of Kasyappa at Sigiriya, the Golden Rock Temple of Dambulla, are all within a half day's excursion. Wildlife and culture enthusiasts may like to visit the Ritigala archaeological and forest reserve. Polonnaruwa and Sigiriya are outstanding archaeological sites which are also good for watching primates. Many of the country's finest hotels are located within half an hour to an hour's drive of Minneriya. The famous 'Kandy Perahera' (Pageant) takes place every year for a week around the end of July and the beginning of August. A large number of caprisioned elephants (top) at the Kandy Perahera demonstrate the close cultural relationship between people and elephants in Sri Lanka which spans over two thousand years. 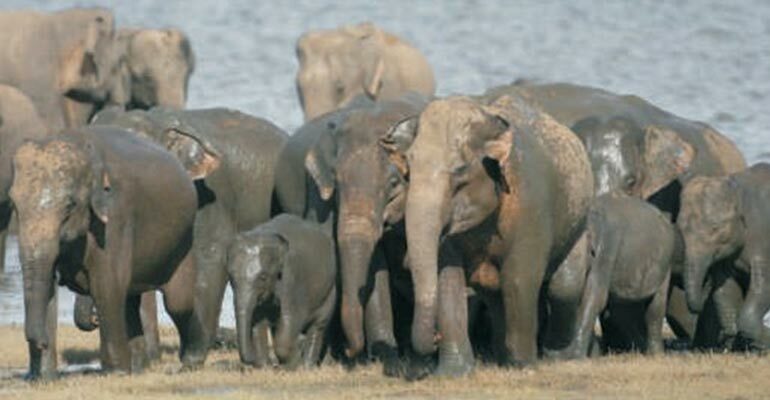 Peaking in August and September, The Gathering of Elephants is the highest concentration of wild Asian Elephants. 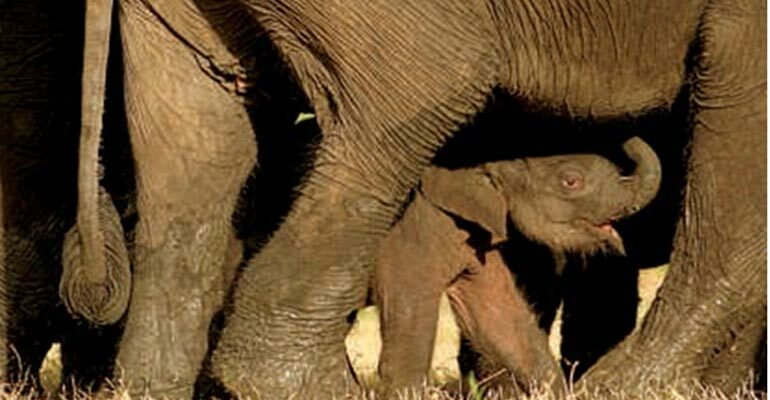 It offers an un-paralleled opportunity to observe large numbers of wild Asian Elephants. DAY 01 Arrival and transfer to hotel in or near Colombo. Excursion to Talangama Wetland for wet zone wildlife including the critically endangered Western Purple-faced Leaf monkey. DAY 02 After breakfast leave for the Cultural Triangle area of Sigiriya / Habarana / Dambulla for three nights. Afternoon, safari with your naturalist guide, at Minneriya National Park. Between July and October elephants are gathered with a peak in August and September. A one kilometer quadrat can have over 300 elephants gathered on the receding shores of the Minneriya Tank. 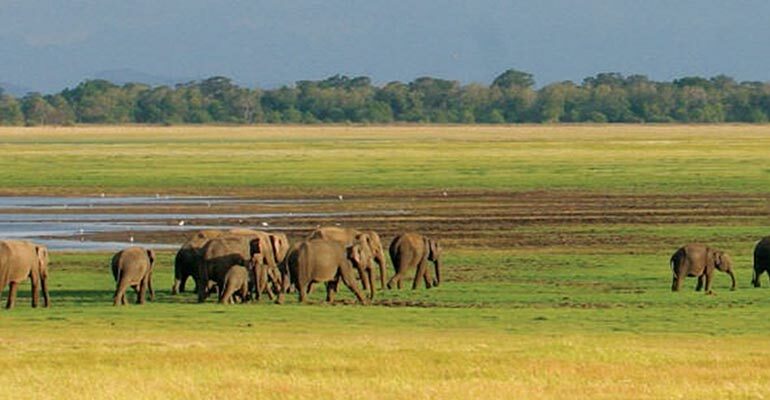 'The Gathering' of Elephants at Minneriya is one of those awesome spectacles, which rank alongside better-known wildlife spectacles such as the migration of wildebeest in Africa. DAY 03 Morning, visit Polonnaruwa (A UNESCO World Heritage Site), the medieval capital of Sri Lanka. you will encounter troops of Toque Macaques, who were famously featured in both the BBC's 'Temple Troop' and David Attenborough's 'Life of Mammals'. Afternoon, another safari at Minneriya National Park for Elephants. DAY 04 Morning, visit Sigiriya Rock Fortress, which was the pleasure capital of a single king called Kashyapa in the 5th century A.D. Afternoon, photography at Minneriya National Park once more. DAY 05 Transfer to the highlands or for a break on the beach. Depending on the movements of the elephants, your naturalist guide will take you to either Minneriya or Kaudulla National Park. The spectacular Kandy Perahera takes place between the last few days of July and first few days of August. 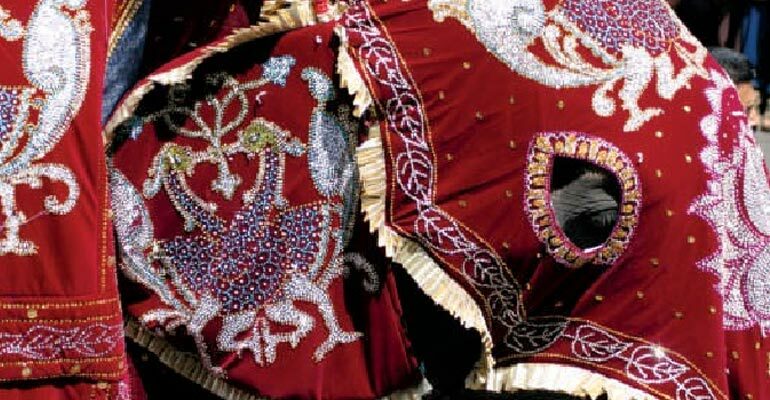 Dozens of caparisoned elephants are accompanied by dancers, drummers and torch bearers in this wonderful pageant.